Fighting continued Saturday for the second consecutive day in Aleppo, Syria’s second city, between rebels and the Syrian army, which gained ground Friday in Damascus during a murderous day with over 200 dead. According to the Syrian Observatory for Human Rights (SOHR), “clashes have continued since Friday morning between regular forces and rebel units in the district of Salaheddin,” in Aleppo (north). For their part, the opposition Local Coordination Committees (LCC) reported “an exodus of residents for fear of an offensive bombing operation” against Salahuddin, located at the heart of the country’s economic capital. Remained like Damascus away from the popular revolt against the regime of Bashar al-Assad, Aleppo rallied in recent months, mainly in the city’s University, the nerve center of protest. A new front had opened in this city Friday after heavy fighting broke out July 15 in the capital. In Damascus, where the situation remains very tense, traffic was light Saturday morning and no shelling was heard overnight. According to the SOHR, however, the districts of Qadam and Assali, in the southern outskirts of the capital, were bombed by the army during the night. In response to the “battle of liberation” in Damascus announced Tuesday by the rebels, the Assad regime’s army had launched an offensive that on Friday allowed it to regain control of the Midan district after heavy fighting. Having stormed Qaboun, the army entered the quarters of Jobar (east) and Kafar Sousse (southwest), according to the SOHR. In addition to Midan, a Syrian security source said on Friday that the army now controlled Tadamoun (south), Qaboun and Barze. However, fierce fighting raged on Friday in Jobar, Roukneddine (north), and especially in “Mazze,” Kafar Sousse and Daraya, south and west. 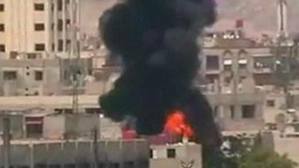 The army also came to Shebaa, a suburb of the capital, after a bombing that left one dead and dozens injured, according to the SOHR. In the rebel city of Homs (center), several neighborhoods, including Khaldiye, were shelled by the army who tries to retake control, the source said. In total, 233 people – 153 civilians, 43 soldiers and 37 rebels – were killed Friday, according to the SOHR. Meanwhile, Israel is closely monitoring the situation in Syria and would be ready to intervene if the Syrian government handed missiles or chemical weapons to the Lebanese Shiite movement Hizbullah, said the Israeli Defense Minister Ehud Barak on Friday. “I have instructed the army to increase its preparations and intelligence efforts and take action so that (…) (if necessary), we are able to consider conducting an operation,” Barak said in an interview last night. “We follow (…) the possible transfer of sophisticated ammunition system, mainly anti-aircraft missiles or ballistic missiles, but there may also be the possibility of a transfer of chemical weapons from Syria to Lebanon , “he added.